Ms. Celiac Says...: Bubble Pop Delicious! Ever wonder which chewing gums were safe for you to chew and which contain gluten? Well, I've compiled a list of gluten free chewing gums by checking with the manufacturers on their gluten free status. To my surprise, it is quite a lengthy list. For starters, all Trident gum is gluten free! 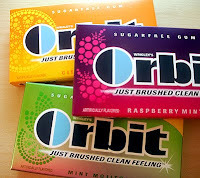 Other brands with gluten free chewing gum include: Wrigley's Spearmint gum, Freedent gum, Doublemint gum, Extra gum, Big Red gum, Eclipse gum, Juicy Fruit gum, Winterfresh gum, Orbit gum, Orbit White gum, and 5 gum. Below I have included a list of the exact flavors that are gluten free. Enjoy!